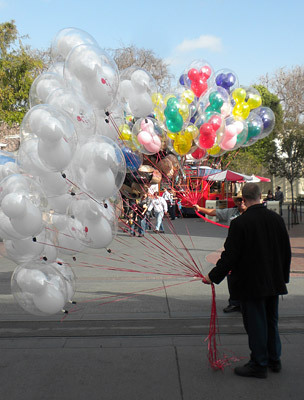 In the early days of the park, simple, non-buoyant balloons attached to sticks were available. Hot-air balloons were tested, but found to be impractical and short-lived. These paved the way for hydrogen-filled balloons, the horrible, tragic, fiery result of which needs not be described here (but led to the park’s restrictive smoking policies and the sudden elimination of Tomorrowland’s Wonders of Tissue Paper exhibit). The next innovation — also doomed to failure — was the transparent balloon. In these innocent times, it was thought that there was nothing wrong with rendering balloons transparent by fitting them with small, tube-powered x-ray emitters. This had the added bonus of making guests with balloons look like glowing skeletons when on any of Fantasyland’s dark rides. Although many guests discovered hidden cancers and self-diagnosed serious injuries using these amusing toys, they were eventually banned by federal law. 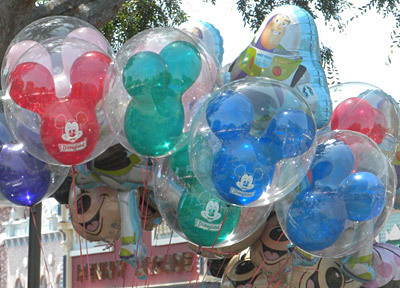 The famous “Mickey Mouse” balloons have been a staple of the park for decades. Other shapes have been tested over the years (including the popular Baloo balloons in the 1960s). Balloons at Disneyland are currently $7 apiece, $14 for two, $21 for three, etc., with the volume discount continuing in this manner up to a maximum of 60 balloons (the maximum number a cast member can carry at one time without legally being classified as a flotation device). One strange balloon-related practice — “Carling” — arose (no pun intended) after the release of Pixar’s film Up. Someone who wants to Carl approaches a castmember selling balloons and purchases their entire stock. The balloons are then released en masse, with the results often filmed and posted on YouTube or other social networking sites. Because of the high cost of purchasing an entire lot of balloons, several Disney fans have crowd-funded their Carling projects on Kickstarter, sending videos of the hilarity (including crowd reactions) to those who donated. The related practice of buying a large number of balloons and attaching them to the belt of a very annoying small child is impolite, frowned upon, and a felony. An interesting aside: the Up-inspired idea of buying a bunch of balloons and giving them away to nobody is where the phrase “giving up” came from.